J. M. Coetzee's early novels confronted readers with a brute reality stripped of human relation and a prose repeatedly described as spare, stark, intense and lyrical. 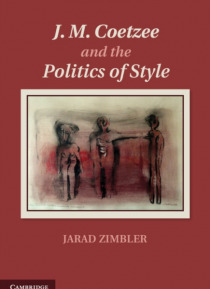 In this book, Jarad Zimbler explores the emergence of a style forged in Coetzee's engagement with the complexities of South African culture and politics. Tracking the development of this style across Coetzee's first eight novels, fro… m Dusklands to Disgrace, Zimbler compares Coetzee's writing with that of South African authors such as Gordimer, Brink and La Guma, whilst re-examining the nature of Coetzee's indebtedness to modernism and postmodernism. In each case, he follows the threads of Coetzee's own writings on stylistics and rhetoric in order to fix on those techniques of language and narrative used to activate a 'politics of style'. In so doing, Zimbler challenges long-held beliefs about Coetzee's oeuvre, and about the ways in which contemporary literatures of the world are to be read and understood.